126 AIR DEFENCE CADET CORPS HISTORY. The Derby Squadron of The Air Defence Cadet Corps. was formed in 1938 and assembled each week at Highfield House, Broadway, Derby. The unit was controlled locally and had no connection with the Royal Air Force. It was formed under the auspices of the Air League of the British Empire. In 1941, the Air Defence Cadet Corps. was formally established as the AIR TRAINING CORPS. By Royal Warrant. A number of further Royal Warrants were issued, the last one was dated 19th. February 1990 and introduced more recent regulations. The 126 Derby Squadron moved from the Broadway address, to Hasting Street School, where all the educational instruction was given. A Number of social occasions were organised there particularly following the formation of the W.J.A.C. next door. Each Sunday, parades took place at the R.A.F. Station in Alvaston, where all drill procedures were carried out. This station was the then HQ for Balloon Barrage Staff and Personnel. During the war years, cadets carried out many voluntary duties at R.A.F. Stations in Derby area, mostly on balloon barrage sites also. When on week duration visits to operational stations in Lincolnshire, they assisted in “Bombing Up” before raids. There was very little opportunity to get any flying experience at this time. Among the R.A.F. Units visited were Newton in Nottinghamshire, Scampton, Silby and Swinderby in Licolnshire. A complete book could be written on visits and experiences i.e. Witnessing the first flight of “The Flying Bedstead” at Hucknell R.A.F/R.R. Experimental Unit, later to become the vertical take-off aircraft. A very important part of the 126 Derby Air Training Corps. 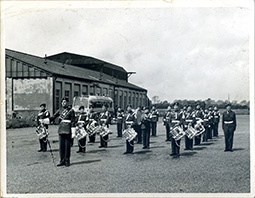 was the formation of the Corps Band. It consisted of six drums and six bugles with a Drum Major; Flt. Sgt. David Brindley. The band was to be seen at most functions in the Derby area and beyond. The A.T.C. at this time was only open to boys, then a short time later The Women’s Junior Air Corps was formed and based at Sturgess School, which by coincidence is next door to Hasting Street School. The Commanding Officer for The Womens Junior Air Corps. Was Lola Frogart.